Economical beer, delicious seafood and breezy seaside resorts makes Goa India's top tourist destination, a place which can revisited time and again. One of the lesser known beaches, Ozran is quite peaceful and calm with little shacks, rocky coasts and tall palm trees giving an enjoyable picturesque setting. Sitting atop a small cliff with steps leading down to the sea, Alcove Resort was our home for the brief time that we stayed in Ozran beach, Goa. 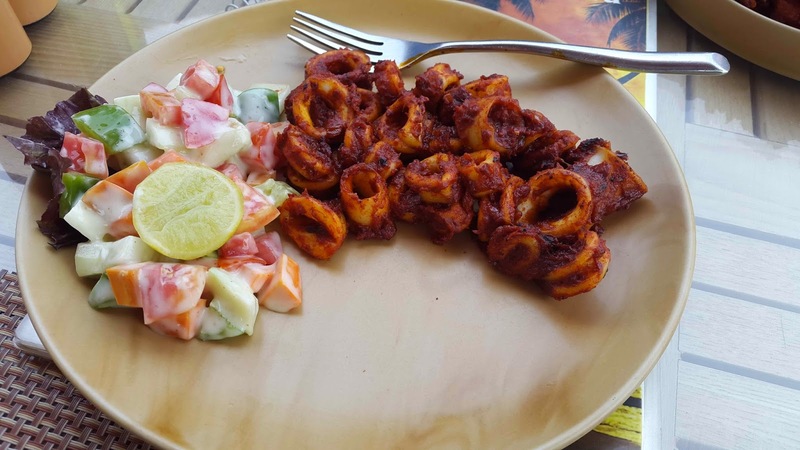 With a good gastronomic spread of Goan, Portuguese and Continental dishes, Alcove had some surprisingly tasty dishes like the Peri Peri Calamari and Chicken Cafreal. A Portuguese styled grilled chicken preparation, the chicken was juicy and spicy. The calamari too was lip smacking with the masala playing a great role in tickling the taste buds. We also tried out their breakfast options - Tuna Sandwich and English breakfast. 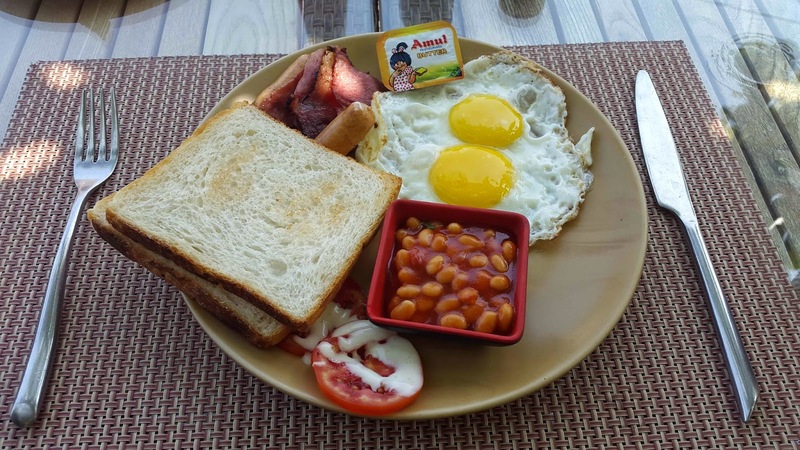 The English breakfast came with bacon, baked beans and eggs made to liking served with bread. 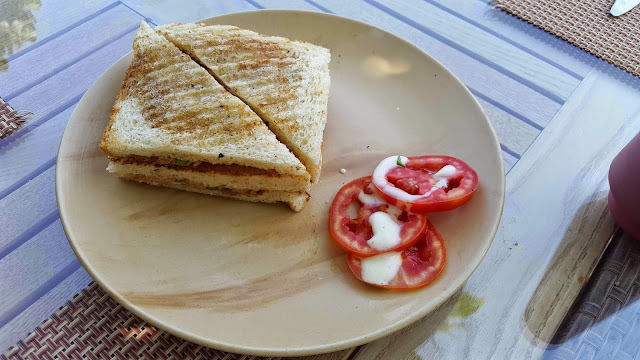 The Tuna Sandwich was perfectly grilled with a handsome helping of cheese and tuna fish. Just a little up ahead from the Alcove Resort on the Ozran Beach Road is Oneº and Thalassa. An excellent spot to watch the evening sunset, Oneº specialises majorly in seafood and continental fare while Thalassa caters to the Greek palate. A must try at Oneº is the Beer Battered Prawns which is served with mayo dip. Light and crisp, the prawns are perfectly marinated and go well with the fresh mayo dip. For the vegetarians, the Crispy Veggies is a good alternative to the Beer Battered Prawns and comes with similar plating and sides. 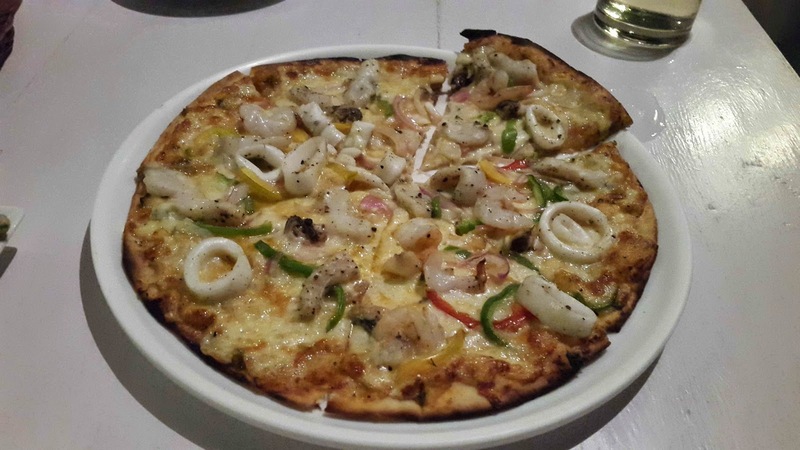 The other items worth trying include the Pepperoni pizza, Seafood Pizza and their speciality, Blueberry Cheesecake. Thalassa is a bit further down from Oneº but the lights and the loud music will draw you towards the restaurant, one way or another. Reservation is a must at Thalassa, else it is very hard to get a table, be it night or day. There are live fire shows and belly dancing to keep the crowd lively and the whole vibe of the place is quite welcoming and entertaining. 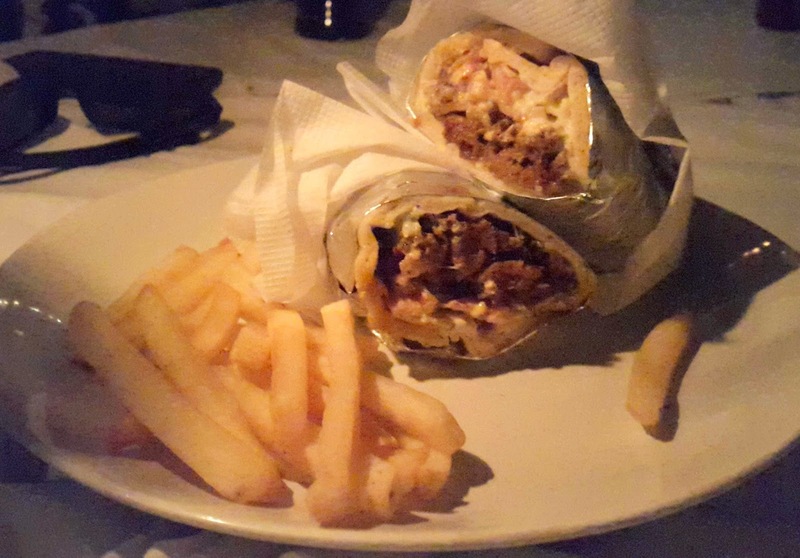 I am not too fond of the Greek cuisine but I loved the Lamb Gyro Wraps served at Thalassa. A bit on the pricey side, the gyro wraps which are the Greek cousin of the Arabic shawarma were thick with juicy meat wrapped with vegetables and neatly packed in pita. 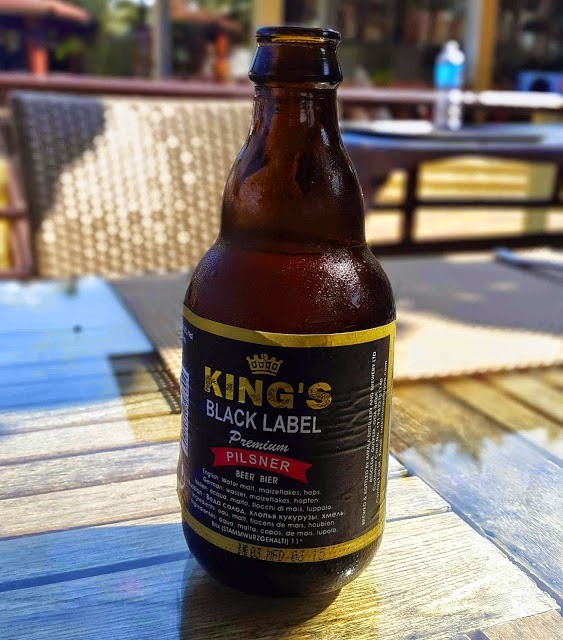 The Long Island Iced Tea served at the bar is also worth the price and is quite potent with copious amounts of the five spirits added to give you the buzz. One cannot, however disregard the beach shacks of Goa in favour of Oneº and Thalassa. After hours of splashing in sea water, one is bound to get hungry and what better way to douse the burning hunger than eating in one of the beach shacks. We visited two beach shacks, Fish Tail which is located just at the foot of Alcove when walking down to the beach and Our Shack which is located close to the Trishul on the beach. 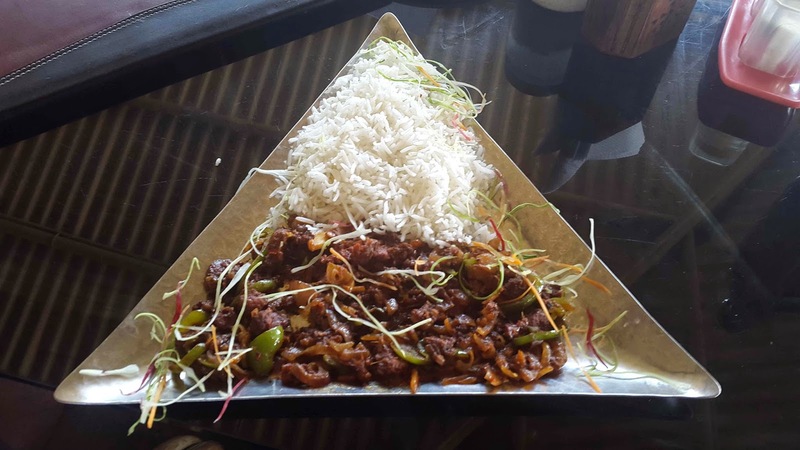 While both are equally adept at the art of making delicious and scrumptious food, the variety at Fish Tail is way better. We tasted the Goan Pork Sausage with Rice and Masala Grilled Pomfret at Fish Tail. The Masala Grilled Pomfret was definitely the highlight of the trip. 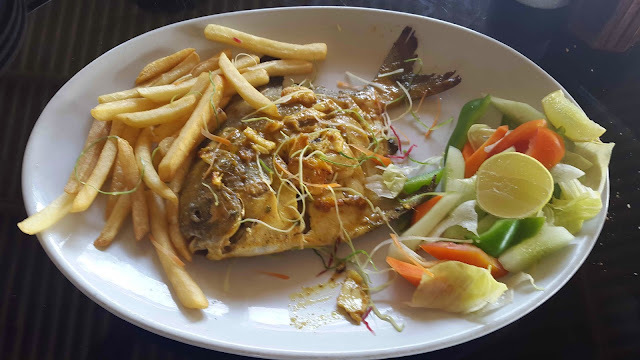 Lightly marinated and served with fries and vegetables, the pomfret was full of flavours which created a taste riot in my mouth. The Goan Pork sausages were made of pig meat with a lining of pork fat and are sliced to increase the surface area for maximum jus penetration. The gravy was quite spicy and tangy and play a perfect foil to the rice. 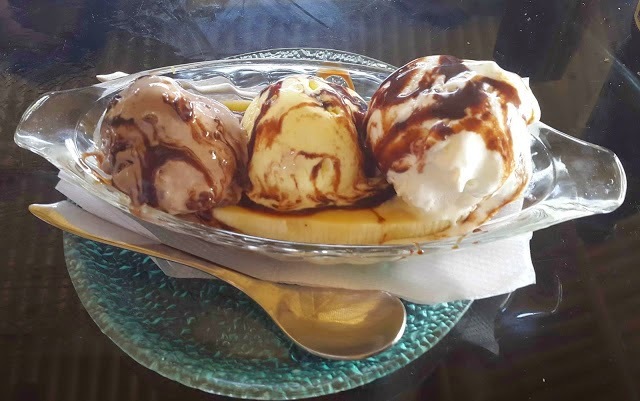 We finished off at Fish Tail with a Classic Sundae and a Banana Split which were made with different ice-cream and the goodness of chocolate syrup; definitely not for the calorie conscious. Our Shack was one of the last stops of our trip. Located almost on the beach, it has a breathtaking view, one you can get lost in. Although they close quite early like most of the small time beach shacks, they were courteous enough to take our last order though most of their ingredients was over. 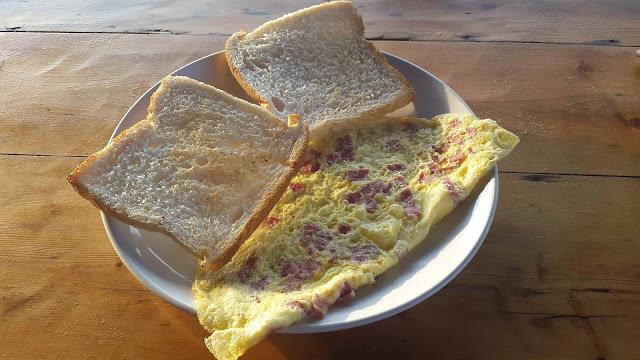 A simple preparation, the bacon omelette was all they could make with whatever was left. The omelette was fluffy with bacon strips bringing in a meaty surprise with every bite. It is fascinating how Goa is filled with restaurants and beach shacks across the coast with each serving the Continental cuisine with Portuguese and Goan influence. 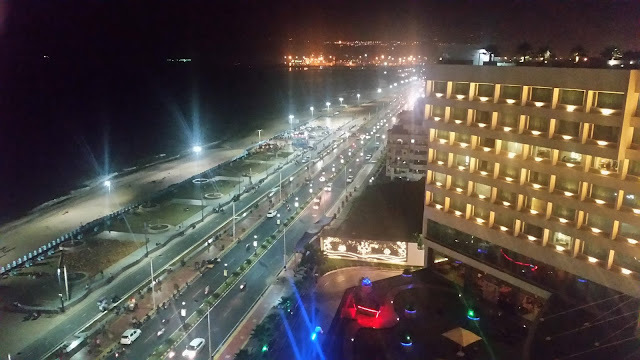 No matter which beach or which part of the town, they just cannot disappoint you !! Thanks Ravish. Goa is so famous for its known beaches that the unexplored ones like Ozran are often given a miss. the pictures are awesome...food looks nice...and i am a veggie but cool place. There are loads of vegetarian delights too which are available at Ozran. I would recommend the Crispy Veggies at One which is really tasty! !